Burp cloths for my little sister (We're only 18 months apart, but she'll always be my little sister.) that just had a new baby boy. I love burp cloths. Double layer flannel are my favorite. They are soft & really absorbent. I just cut two layers in the shape of rectangle with rounded corners & serge all the way around. If using a regular sewing machine, just stitch right sides together leaving an opening for turning. Then turn them out, iron flat & top stitch around. 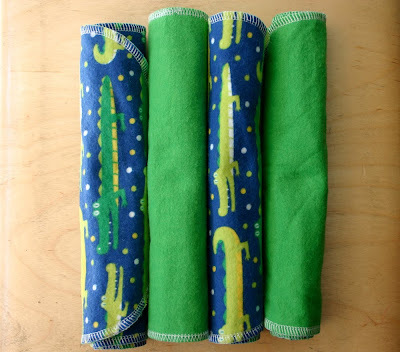 I think they are a sweet, useful gift & they look great rolled up. In going through our camping gear, we realized that one of our mummy sleeping bags was missing it's storage bag. So I sure did just whip one up for it. I thought that the brown fabric looked a little camp like. And I've also been working on some lightweight summer sleeping shorts for the girls. I love to make these a little baggy because they'll fit the girls for a few years. i love that camping bag!!! i think i need one! i just made some pajamas as well. I love sewing also and always find time to make something new. And it saves the money, but the reward is that I have the unique dress or my baby has uniques slippers... This is the essence of sewing for me. And doesn't it make you happy when the husband has confidence you CAN make something? I love that camping bag, I might have to link to it this week- I'm talking camping on my blog! how do you have so much fabric on hand? I've found that by the time I buy fabric, I spend as much as I would have buying pjs. Tell me your secrets Candace. Gorgeous! I love those shorts! So jealous of your skills--all those things are adorable. I'm looking into buying a serger - i'm wondering what yours is and what recommendations you have? I very much agree with sewing to save a little bit of money and the results are always unique! very cool. i thought how cool sadie will be at girls camp with that bag. ;) and weird ryan left such a heart felt comment, huh? weirdo.